A website layout is very important to give better look and feel to your website. Every website has a specific layout to display content in a specific manner. Below the following elements which are used to define the different parts of a webpage. <header>: It is used to define a header. 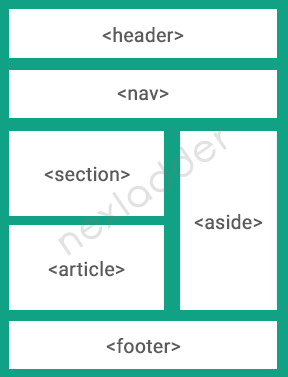 <nav>: It is used to define a navigation links. <section>: It is used to define a section in a document. <article>: It is used to define a independent self-contained article. <aside>: It is used to define a content aside from the content. <footer>: It is used to define a footer. <details>: It is used to define additional details. <summary>: It is used to define a heading for the <details> element.